Part 2 – D-Day Tour 2018 – Utah to Sword! Dodging the Rain in Ste Marie du Mont! Welcome back to my second installment as I tell you more about my D-Day tour. Oddly enough last Saturday I had the pleasure of performing for a special French evening which was held at Padbury Village Hall. 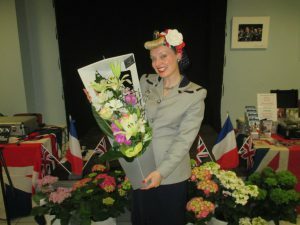 The whole village had come together and the evening gave me a wonderful opportunity to sing all my French songs as I talked about my Normandy tour and included many of the songs I sang along the D-Day beaches. As it turned out that was quite a collective mix as musical tastes in France are changing especially during the commemoration period. 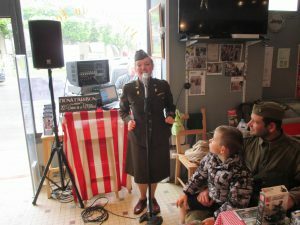 The new D-Day trend isn’t just for songs from the 1940s but for vintage music from the 1950s and 60s as well. Paul Singing at La Boutique du Holdy! Speaking of Normandy my next official D-Day engagement was scheduled to take place on the 4th June in the town of Ste Marie du Mont. 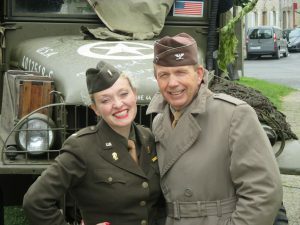 Ste Marie du Mont is on the main road to Utah Beach and Paul and I first had the pleasure of performing there in 2014 for the 70th anniversary. There is a beautiful church which stands right in the center of town where all the re-enacters set up camp with their American war time scenarios. In past years the weather has been fantastic but on this occasion the heavens opened and it pored down all day. La boutique du Holdy. This actually worked really well as people came in for lunch and stayed to hear us sing. Neither Paul and I wanted to be defeated by the weather or let our public down. We sang through regardless and it was so nice to see so many of our friends who had come along especially to see us. Afterwards we met up with our friends from Italy who joined us for dinner despite the inclement weather which as soon as it hit 6pm decided to clear up. Typical! D-Day Dinner. 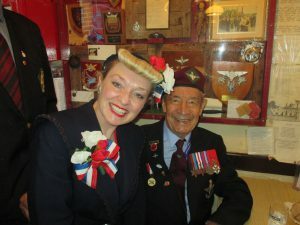 Paul and I traveled over early as there were lots of celebrations taking place in town at Pegasus Bridge and we wanted to soak up the D-Day atmosphere. Once again soak was the appropriate word as the 5th turned out to be another wet soggy day. I felt very concerned for the veterans as many didn’t have any proper waterproof clothing. Sound Checking Before the Mayors Dinner! Parachute Regiment. 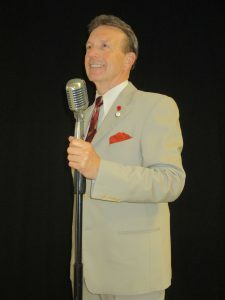 We met Frank again that evening at the Mayors dinner as Paul and I sang a selection of popular war time tunes concluding with “We’ll Meet Again”. Next year Paul and I have been engaged to perform two large public concerts in Benouville. As yet we don’t know if the concerts will be taking place at the chateau or at Pegusas Bridge but keep following my pages and I will keep you posted. museum’s Victorian event. I only have 2 x 30 minute shows to perform daily so this will seem like a holiday. I’m use to working much harder. The museum have a lot of attractions from photo identification, the Palace of Curiosities and a talk on Jack the Ripper. I will be on stage in the Hall of Transport at 11.30pm and 3.30pm both days performing a verity of music from the Music Hall and Operatic stage. It will be delightful to see you. 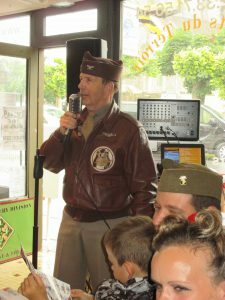 In my next blog I will be telling you more about my 6th June shows in Arromanches as I sang for the veterans dinner in the Salle des Fates and my final performance on the 9th. In the meantime enjoy my photos on my Facebook pages.